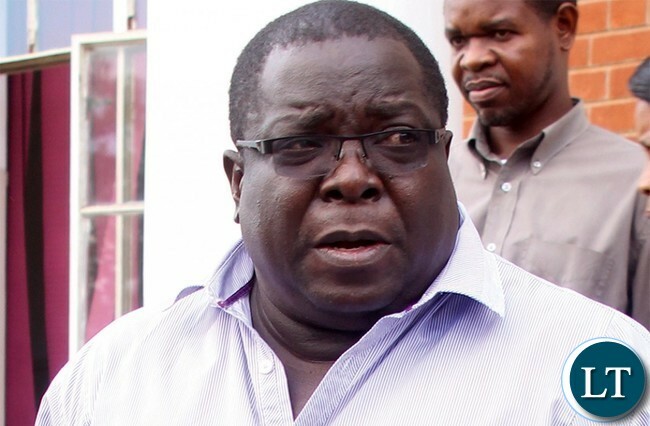 National Democratic Congress Consultant and 2021 Presidential candidate Chishimba Kambwili says he will not take any action against Presidential Affairs Minister Freedom Sikazwe for attempting to punch him at Parliament on Tuesday evening. And Dr. Kambwili has clarified that none of the punches thrown by the Patriotic Front Mpulungu law maker landed on his body. “You see, I can’t take action, look at what happened last time, I reported Bowman Lusambo for hitting me and he was given 30 days suspension from Parliament but he continued receiving his salary. If you are suspended you must lose your earnings”. Dr. Kambwili has said. He said Mr. Lusambo should have lost his earnings as was the case with Elizabeth Mulobeka and Mumbi Phiri who lost their salaries after their suspension from parliament. “This man was allowed to continue working as a Minister even after his suspension, you can only be Minister if you are Member of Parliament and if you are suspended as MP you seize being a Minister”. He added. Meanwhile, Dr. Kambwili said he has become a target of violent attacks from the PF because he speaks the truth and he is not a coward. He said if Zambia had five people like him, the country would have changed for the better. The Roan PF member of parliament survived another beating at Parliament Tuesday evening after he said Mr. Sikazwe was supposed to be a witchdoctor somewhere as he was debating the 2019 National Budget. Mr. Sikazwe got upset and grabbed Dr. Kambwilis neck. Te Mfukwe iyi? He burrows in dirt and feces. Kudos to him, its the right thing to do. Sometimes to take the high road is the right thing to do. Just cant believe Sikzawe the man by the way looks like a sewer rat, can get away with assaulting someone. I am a PhD holder and my name is Mushota Chilufya Chimfwembe. Your search on Google Scholar – Mushota Chilufya Chimfwembe. – did not match any articles. Mushota, you’re nothing more than just another “Bonehead”!!! PHD? My foot!!! Only one behaving like a “Sewer Rat” is you, reaping where you have not sown!!! He shot at me, but the bullet did not hit,i will just let him be. A lawmaker showing us how to handle the law he makes in parliament. Ba Freedom nabena, how he thinks he can beat up Kambwili, not even in his sleep. Why does any one feel like punching you all the time Mr. Kambwili. You look puncheable and look like like a punching bag. Looks like Mr. Sikazwe likes fighting also. Long time ago he was pictured in a punch for punch sizing up during the MMD rule. If you want to rule, stay out of those punches my brother. Don’t put yourself in the punching line to stop other people from getting paid. Forget about aikazwe for sure. These are the of members supporting corruption. Concentrate on building capacity for your party so that they are ashamed. People like Freedom Sikazwe (Auto mechanic certificate holder)can do as they please in Parliament as they know their boss is too weak and Bo Inonge is an old hen awaiting to be offloaded to pasture…next one of them will punch the silly Speaker. Zambians Go and pray with these morons at your day of Prayer!! You H-earn nothing by punching Kambwili maybe the other little boy. Kambwili provoked his friend. He has a foul mouth. If you are provoked by someones mouth in Parley..then you dont belong there!! This man has become a punching bag. You once boosted that you were going to ponona mwaiche Lusambo. What happened was vise versa and the former nurse Jean Kapata applied First Aid on him thinking he had fainted. Both Sikazwe, & Chimbwili are FAT thuggish, fight loving brutes, cut from the same cloth to be honest, all Authentic P.F material, chapwa!! Kambwili, this is the second time you have been clobbered, you should do the same to protect your self these PF ministers are violent since they are all Kaponya`s, you need to teach one of them a lesson so that they know what to expect the next time one of them attacks you, do it outside the parliament fence so that they don’t have PF cadre police to defend them. You cannot be in PF and leave without a disorder? Consultant, my foot! Why has contested his expulsion from PF. He’s not a member of the PF. He’s a member of an opposition party. St in.ky necks are becoming news? Ati Kambwili, MP, kikikikikiki. It is people like Freedom Sikazwe who want to show as though they are the most loyal to ECL that will abandon and betray Lungu when the PF government falls. They will deny him and even testify against Lungu. Let’s learn more about a cabinet Minister and the dos and donts that surrounds the portfolio. Then we shall understand what people like Kalaba Kambwili are doing. Kikikikikiki mudala bazakupayila munyumba yamlamulo namalilo yazakhala mwamene. Are you a punching bag? Come on work up. Kambwili should reflect on what he is saying; he expects others to forfeit “their salaries” by virtue of their suspensions yet he is clinging on to a salary which he, equally, doesn’t deserve. Remove the baobab log in your eye before you remove the mukula tree in Lusambo’s eye. Be principled boy! Let the people of Luanshya vote for you on an NDC ticket, otherwise shut up. You are just as selfish as the people you are pointing fingers at. I’m from Luahshya and will not vote for you, mambala. Watch out Kambwili. Freedom sikazwr will witch you now that you have exposed him. LT it’s Mr Kabwili and not Dr. His is honorary. Meaning that the doctorate is between himself and the awarding University. You may wish to refer to guidance already provided by the Zambia Higher Qualifications Authority.